To make it easier for you to select a ski holiday location in Canada we have provided some information on each ski holiday location. With this ski holiday location information and our ski resort information you can find the most suitable ski location for you and your family or group. We have an office in the Canadian Rockies year-round so if you are unsure, please contact us and we can send you more details on the most suitable ski location based on your preferences. We can also provide a ski package with two or more ski locations in one ski holiday and we can usually connect each ski location with an activity or tour so that you won't lose a day travelling. 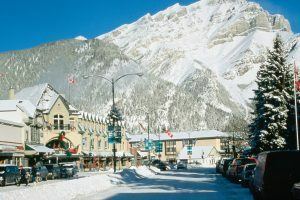 Banff - Our most popular ski holiday location, Banff, is an all time favourite with families as there is plenty to do besides skiing and snowboarding with all the Banff winter tours available . Just 2.5 hours from Calgary International Airport, Banff is easily accessed by a regular airport transfer service. Canmore - Canmore has the Nordic Centre built for the 1988 Calgary Winter Olympics which has excellent cross-country trails. Canmore ski accommodation usually costs less than nearby Banff but there are no ski shuttles from Canmore as it is further away from the ski resorts but closer to Calgary International Airport. Fernie - There are ski-in and ski-out properties at Fernie Alpine Resort which receives plenty of snow. At 4 hours one way from Calgary Airport, this extra travel time usually rewards the dedicated skier or snowboarder some awesome powder turns. Jasper- Winter is the off-peak for Jasper and the extended travel time of about 5 hours from Calgary International Airport is worth it to get away from the crowds and save money. Jasper Marmot Basin now has the longest high speed quad chair in the Canadian Rockies. Kicking Horse - Plenty of steep at Kicking Horse Mountain Resort means that intermediate to expert skiers and snowboarders will not be disappointed. As Kicking Horse Mountain Resort is smaller in comparison to other ski holiday locations, Kicking Horse is ideal for ski and snowboard enthusiasts. Try out Kicking Horse Mountain Resort for a day from Banff or Lake Louise onboard the Kicking Horse Powder Express. Kimberley - Is a smaller resort town with plenty of Bavarian charm - best suited for families. Ski-in and ski-out on-mountain properties are available and your lift pass at Kimberley entitles you to ski at Fernie Alpine Resort for a day. At this time, the only travel options from Calgary International Airport YYC are a private airport transfer service, car rental or you can catch an additional flight to the Canadian Rockies International Airport (formally known as Cranbrook airport). Travel time from Calgary Airport to Kimberley is about 4.5 hours. Calgary Airport is the nearest airport to Kimberley for guests flying in from the U. K.
Lake Louise - This is another ski holiday location for ski and snowboard enthusiasts as Lake Louise itself has a population of about 500 people in the winter time and so there is not much else to do besides skiing and snowboarding. Most hotels in Lake Louise are just 5-10 minutes away from Lake Louise Ski Area onboard the free village shuttle. The Fairmont Chateau Lake Louise is spectacularly situated on the shores of Lake Louise. Panorama - Located at the base of the Panorama Mountain Village ski resort, Panorama offers plenty of ski-in and ski-out properties to choose from. A favourite with families, Panorama has larger ski accommodation units with one, two and three bedroom condos and townhomes available with varying levels of luxury. Whistler - Located at the base of Whistler and Blackcomb Mountains, Whistler provides access to Whistler Blackcomb ski resort. Whistler has it all and has enough terrain for you to keep coming back for more. Vancouver International Airport YVR is the nearest airport to fly into and from there, expect to travel for an additional 2.5-3 hours to get to your Whistler ski accommodation. From studios to large townhomes, there is plenty of selection.